In 1999, Engine released a great self-titled debut. At that time, the band was meant to be nothing else but a project by the following musicians: Ray Alder (Fates Warning), Joey Vera (Armored Saint, Fates Warning), Bernie Versailles (Agent Steel) and Pete Parada (Face To Face). As Engine play a kind of groovy hard rock and this music is very different from what the different musicians normally play, they decided to release another record. 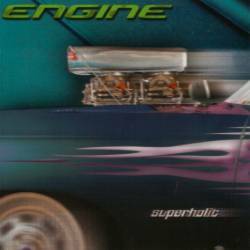 The new one is called Superholic and the cover artwork is showing a racing car. Listening to front man Ray Alder, engines and racing cars are good ways to explain what the songs are about. After having listened to the first two songs Losing Ground and Suffocated, you're already in the mood for Superholic. But the CD highlight is the title track where real heavy and progressive parts do often change. Some people may say that Ray Alder's voice is better fitting with progressive sounds, but I think that he isn't a bad rock singer either. Although the differences between this CD and the debut are quite small, it is nevertheless a pleasure to hear new songs by Engine who have put two more surprising songs on the CD: Fascination Street is a cover version by The Cure, 1 a.m. is a slow unplugged song which got written on New Year's Day. It sounds as is the musicians were still working with their hangover.